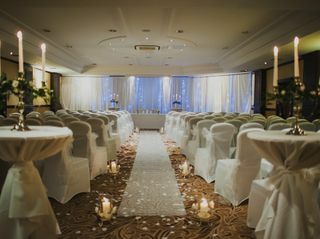 It was a pleasure to dress your venue for your Wedding, thank you for the lovely review. Great service, I was shocked as it was such good value for money. My hall looked amazing! The team were so supportive of what I wanted and everything I wanted and more. I could not thank them enough. It was a pleasure decoration the Club for your wedding. My wife and I enjoyed meeting you are were happy to meet your requirements. Thank you for such a lovely review. 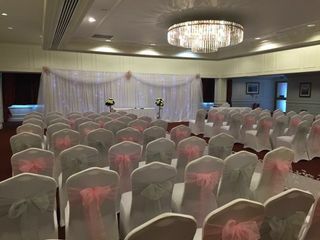 Wils Chair Covers responded quickly on Facebook to my last minute chair hire request. They are reasonably priced. They are very professional with great communication, even texting me a picture of the chairs all set up on the morning of the wedding! I would definitely recommend their service. 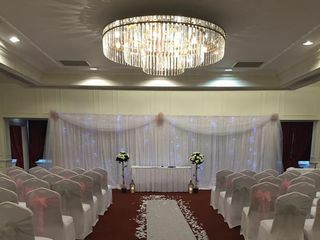 Was overall happy with the service the runner we had asked for was meant to be plain white but ours was see-through which we weren't really keen on plus we had asked for a longer aisle runner, chair covers and sashes were very nice. Cannot thank the company enough for the service we received. 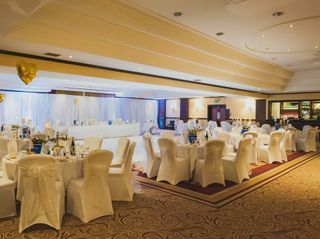 All our wedding guests commented how lovely the tables were dressed. All emails were answered with excellent response time and also the company are really flexible and helpful. I would thoroughly recommend to anyone. Fantastic service! So flexible and happy to accommodate my requests. I was so pleased with how the room turned out in the day. 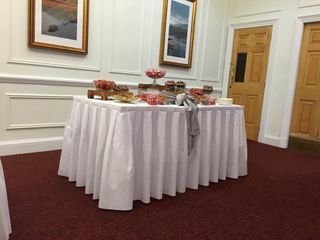 First seen Ken and Wilma set up at a friend's wedding and was so impressed with them and their products I booked them for my wedding. Would not hesitate to recommend them. Thanks so much! Zoe, we are happy that the rooms lived up to your expectations when you saw them, it was our pleasure to decorate for you. From our point of view you were a great client with fantastic communication, and we are proud to have been involved in your fantastic day. They provided beautiful chair covers with sashes of our choice. Lovely centerpieces and dazzling starlight backdrop! Fantastic customer service, very professional and supportive! They had everything just perfect for us and very reasonable priced, would highly recommend, 5star plus. Thank you Sarah for such a lovely review, we enjoyed decorating the venue for you and your guests. 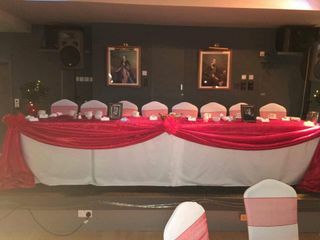 I was extremely happy with my service from Wils Chair Covers, they were very professional and their service was brilliant. They contacted the venue and arranged with them about setting up and times they could be available so I didn't have to worry about it with everything else I had to do. I would highly recommend them. Thank you Donna, we aim to not just please with our decor, but also to assist relieving as much of the pressure of the day as we can, it was a pleasure to decorate for you. These guys were contracted by the company I booked a year ago, when they didn't receive payment they contacted my venue to let them know what was happening and if they hadn't my venue would not of been dressed! They pulled everything together in a day and gave me a dressed venue better than I had dreamed! They even came back on the Saturday night to take down the back drop! I can't fault a thing and would recommend them to everyone! Brilliant people with their heart in the business! My day would have been ruined without them! Can't thank them enough! Fantastic service and all my guests and others have commented on how stunning they made everything! Thank you so much guys, I will not forget what you did for us! Thank you very much for your lovely comments, we are so glad we were able to help make you day. A very professional service! 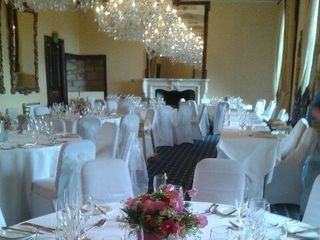 Wils Chair Covers arrived on time and set up our wedding beautifully. They were only too happy to help with anything else we needed. Great value for money would highly recommend.